He was a collegiate national champion wrestler, then parlayed that into a successful career as a WWE employee. If you thought I was talking about UFC heavyweight champion Brock Lesnar, think again. The formula might be the same, but Bobby Lashley is trying to get to where Lesnar currently is. Lashley will be taking on MMA veteran Jason Guida this Saturday on Roy Jones Jr’s. hybrid boxing/MMA pay-per-view event in Pensacola, Florida. The 32-year-old Lashley will be entering only his second career professional fight. The good news is that he is undefeated. The bad news is Guida has almost 40 times more fights than the three-time NAIA national champion, although 17-19 isn’t anything that will score you more chicks. In his pro debut, Lashley TKO’d Joshua Franklin in the 1stRound of their Mixed Fighting Alliance bout. It was Franklin’s first MMA scrap as well. Not too much time has passed since his December debut, however the American Top Team fighter is confident that he has improved enough to make short work of the experienced Guida. 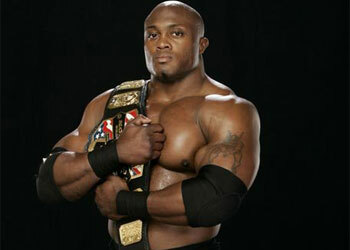 If Lashley’s prophecies come to fruition, he will be well on his way to following in Lesnar’s gigantic footsteps. Although the journey will be a lengthy one, he thinks his combination of hoopla and talent will ultimately get him there. “This is a results-oriented business, and it’s up to me to take advantage of the opportunity I have been given,” Lashley said. “Of course I want to make it to the highest levels of this business. Who doesn’t? I’m not expecting anything to be given to me, though.